So there you have it. Illegal immigrants: 393,000. Lying moms: one. Bankers: zero. The math makes sense only because the politics are so obvious. You want to win elections, you bang on the jailable class. You build prisons and fill them with people for selling dime bags and stealing CD players. But for stealing a billion dollars? For fraud that puts a million people into foreclosure? Pass. It's not a crime. Prison is too harsh. Get them to say they're sorry, and move on. Oh, wait — let's not even make them say they're sorry. That's too mean; let's just give them a piece of paper with a government stamp on it, officially clearing them of the need to apologize, and make them pay a fine instead. But don't make them pay it out of their own pockets, and don't ask them to give back the money they stole. In fact, let them profit from their collective crimes, to the tune of a record $135 billion in pay and benefits last year. What's next? 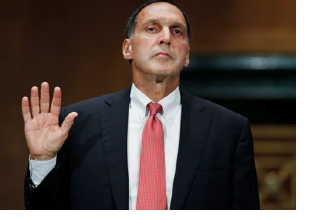 Taxpayer-funded massages for every Wall Street executive guilty of fraud?